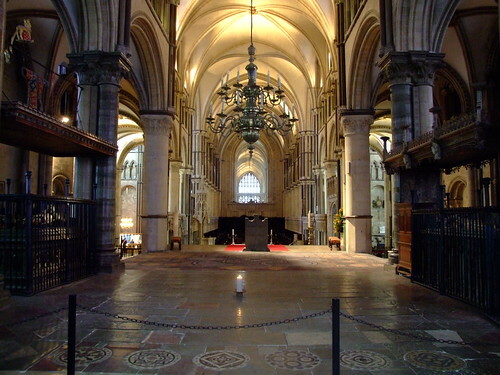 It was reckoned to be one of the most richly adorned shrines in Christendom, thanks to the generosity and devotion of the pilgrims who donated to it. I find it heartbreaking to look over the empty space resulting from the callous and spiteful destruction of Henry VIII which also involved the alienation of a large amount of valuable property. Apparently 26 wagons were needed to carry off the valuables after the attentions of the Commission for the Destruction of Shrines. What could be melted down ended up at the Royal Mint at the Tower of London. St Thomas excited Henry's particular hatred because he stood up for the rights of the Church against the usurpations of the crown. 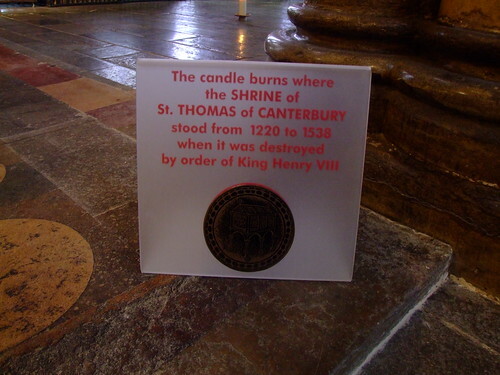 The story of St Thomas being put on trial for treason and being sentenced to having his bones burnt seems to be reckoned as apocryphal, but there was a determined effort at rubbishing his memory by blaming his death on his own behavour. I suppose with all that taking by the bosome, shaking and plucking, and calling people bawdy he was just asking to have his skull cleaved in half and his brains poured out all over the flagstones. Some of those "bokes" can be found in the British Library whose Medieval Manuscripts blog has a fascinating page on Erasing Becket.